If you haven’t seen Nettle yet now is your last chance for awhile. 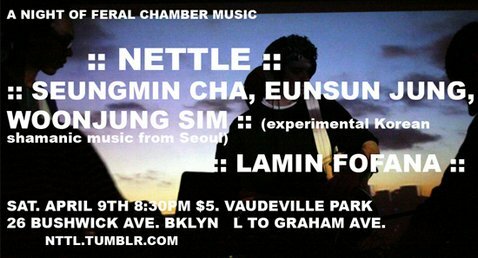 We’ve also invited the Seoul-based trio of Cha, Jung, and Sim. The three women are Korean traditional music virtuosos who’ll be sharing their very intense, very far out take on Sinawi and Sanjo ritual music. And Dutty Artz Recording Artiste Lamin Fofana is gonna debut his hybrid live/DJ performance. So come explode with us, this evening will be special.